I enjoyed sharing about Growing Up With G.I. 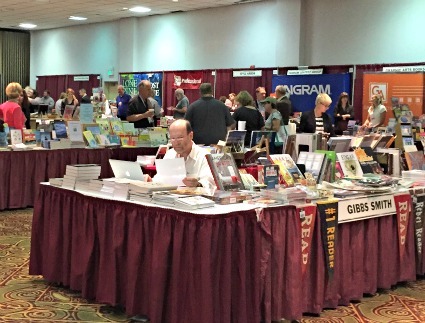 Joe’s at the Pacific Northwest Booksellers Association trade show in Portland in the first weekend in October. Kathy McCuddy Johnson volunteered to help at the Columbia Press table and even brought homemade cookies! 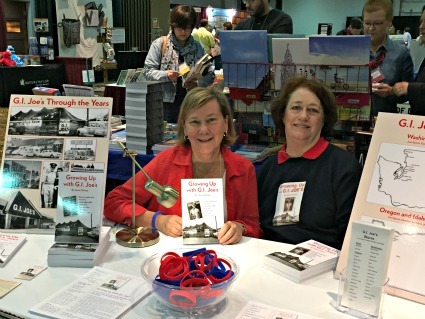 Besides the books, the red and blue wrist bands were winners, inscribed with “GO FOR IT” which was a slogan for G.I. Joe’s in the late 1970s. Above is a view of part of the exhibit area at the PNBA show. This entry was posted in Uncategorized and tagged PNBA trade show, Portland. Bookmark the permalink.